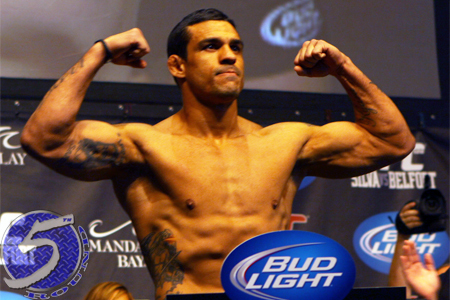 Vitor Belfort (pictured) isn’t the first UFC fighter to take testosterone replacement therapy (TRT), but it appears Belfort is the one getting the most heat from the planet’s premier mixed martial arts promotion. UFC president Dana White has teeter-tottered on the controversial subject over the years. When he abruptly cut Nate Marquardt in June 2010, White admitted “Nate the Great” may have used TRT as a performance-enhancing drug (PED) because Marquardt was so far beyond the legal limits when he flunked his pre-fight drug exam. As recently as six months ago, White did an about-face claiming to be fine with TRT as long as fighters submitted their doctor’s notes to athletic commissions in order to be granted a therapeutic-use exemption (TUE) to be on it for their upcoming scraps. However, last month White decided to take a firm stance against any of their athletes who claim to need TRT in order to compete. White said the company would begin to rigorously and randomly test TRT fighters throughout their training camps. Belfort is the latest in a growing number of UFC fighters to have his use of the medically prescribed treatment publicly disclosed. The reason Belfort’s situation is different than say fellow TRT consumer Chael Sonnen is that “The Phenom” previously screened positive for elevated levels of testosterone in 2006. Nevada State Athletic Commission executive director Keith Kizer recently said Belfort would never be granted a TUE by his committee because of his prior PED abuse. It is believed Belfort began using TRT in his last two bouts, which both took place outside of the US. The 35-year-old’s upcoming scrap against Luke Rockhold will go down in Brazil. White was asked following Thursday’s press conference in Montreal if it is now impossible to showcase Belfort in America because of his requirement for TRT. The cheater’s handbook for TRT suggests athletes are manipulating the regimen while preparing for a fight. They will jack up their testosterone levels beyond normal ranges in order to push their bodies to its outermost limit. As showtime steadily approaches, they will then taper off the treatment to get their testosterone back to a natural level – therefore, no flunked drug tests. That’s why the UFC is cracking down hard on TRT fighters. Sonnen revealed last month the UFC has already visited his gym to request a urinalysis.